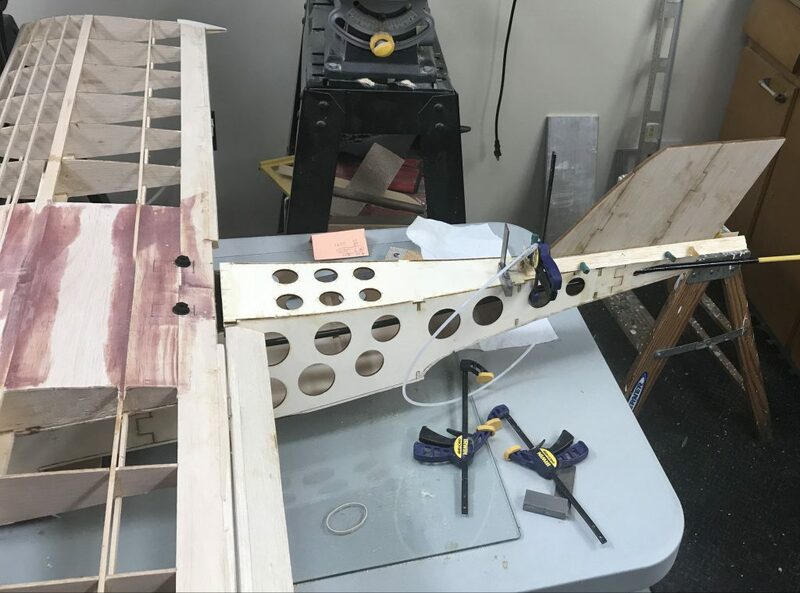 On Saturday I got to work on my plane again and made some more progress on covering and installation of the fuel tank. One of the discussion Peter & I had in a previous session was what I’d like to do with the cockpit, use covering or paint it. I decided to go with painting it as I felt under the heat of summer with no airflow under the canopy that covering would wrinkle and be a waste, so Peter stained the cockpit green, seen at the top. I continued where I left off last session by completing the covering of the fin in white. I was able to utilize the knowledge I learned from John in my last session about covering. I was impressed with the result. I didn’t quite get it right the first time so had to switch around the covering and start again (as the glue along the one edge was no longer good after pulling up the heated covering). Throughout the process I had to make some incisions at the top and bottom to allow the covering to come around properly, which includes removing excess when I could. Tuesday was an excellent covering session and nice to get in back to back days working on my plane. Covering is definitely a time consuming task and the tail with all its intricacies took a lot of concentration and patience. Throughout the process I learned how to do things better, namely so that I do not get the wrinkles when rounding corners causing a jagged/rough looking edge with wrinkles in the fabric. This is where the wrinkles really come in! After that was finished up brought the fuselage up onto the workbench as I’m now on to covering the fuselage! 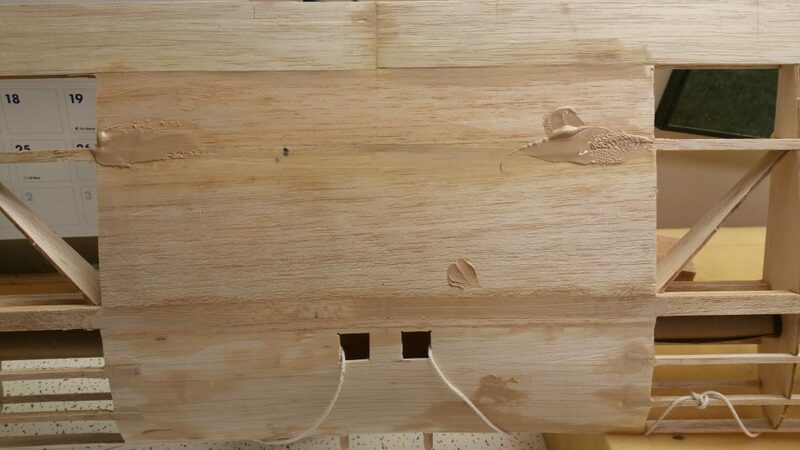 As you’ll notice from the pictures I am doing the fuselage and fin white. Because you want your seems to be such that the covering is overlapping from front to back, prevents the air from getting under and peeling back the covering, we start at the table and work our way towards the nose of the aircraft. Had another great building session with Peter today. I started with covering the other wing tip in green, which again took a lot of time and due diligence! I was able to do this one by myself as I remembered what I learned from working with Peter & John while covering the other tip, bottom of this post. Afterwords I glued the balsa tail fairing blocks into place. 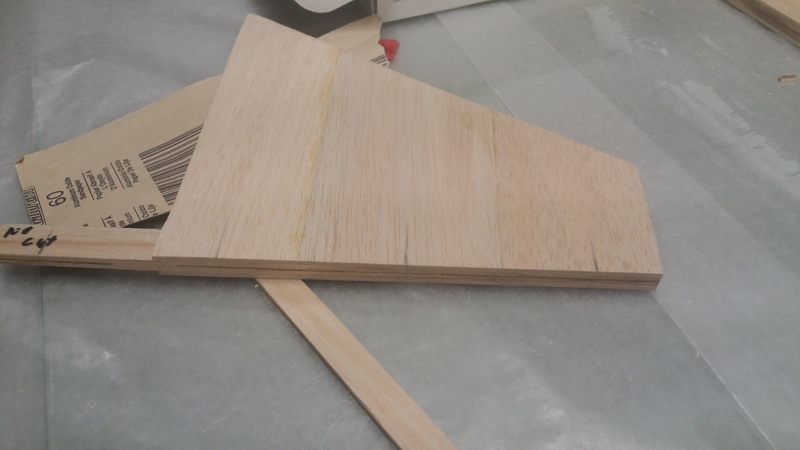 In order to do this I cut two 3″ lengths of 1/2″ balsa triangle stock to serve as tail fairing blocks. I then marked one for each side of the fin. Peter showed me on the first one how to angle the back so it tapers from front to back. You mark a line for the max you can go for your tapper as well as marking where F6 (Former) rounds against the block as you then sand to achieve the desired taper at the back and to get it to be ‘aerodynamic’ with F6, as you don’t want it to be squared up above creating unnecessary resistance. 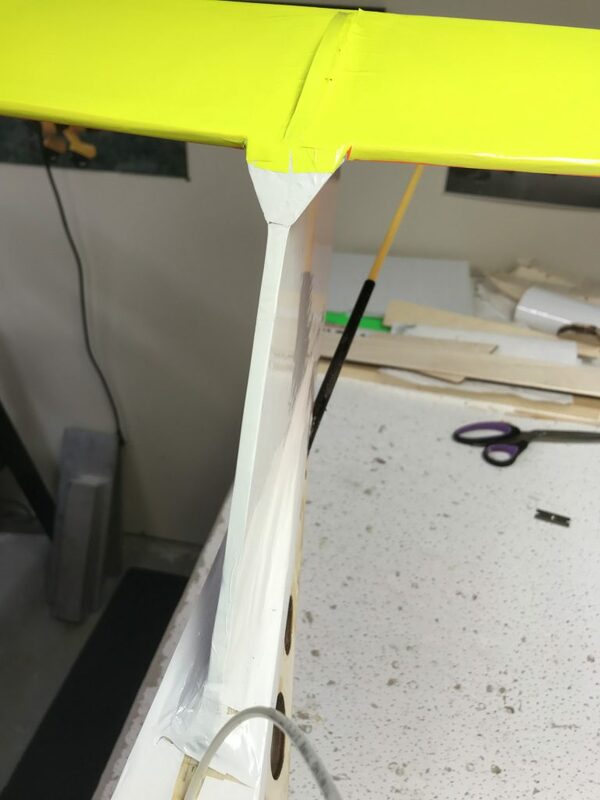 The reason for these two blocks is that in the design the fin is not sturdy enough without them and can cause the fin to flutter or break off during flight. 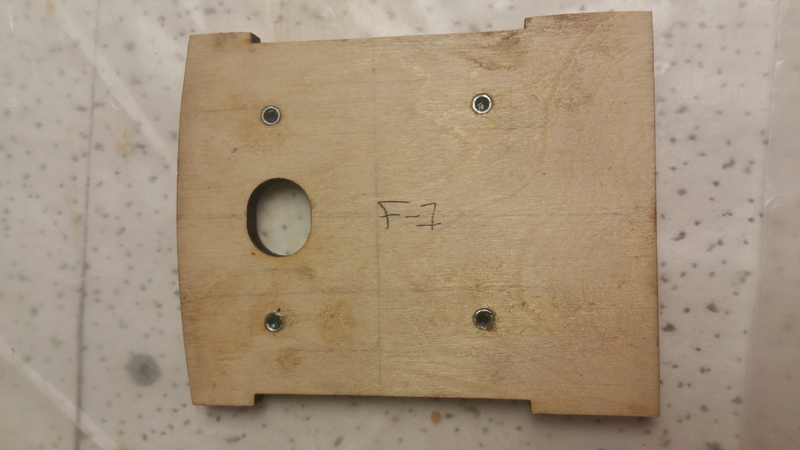 These two fairing blocks provide additional support to the fin to help prevent side to side movement. 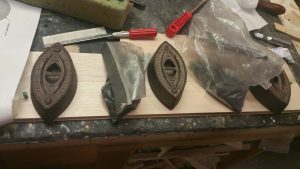 After that was completed we poured some glue into a small container and mixed in another compound with the glue in the original container. The compound makes the glue thicker, so you keep adding and stirring until you get the consistency you are looking for. We then went over the sheeting on the wing and found any little whole, indent, ding, ‘non-smooth surface’ we could find and filled it with the mixture. We then left it to dry. The beauty of this mixture is that it is easy to sand, so next time I’ll sand for a smooth finish. Today I got over for another great building session with Peter. 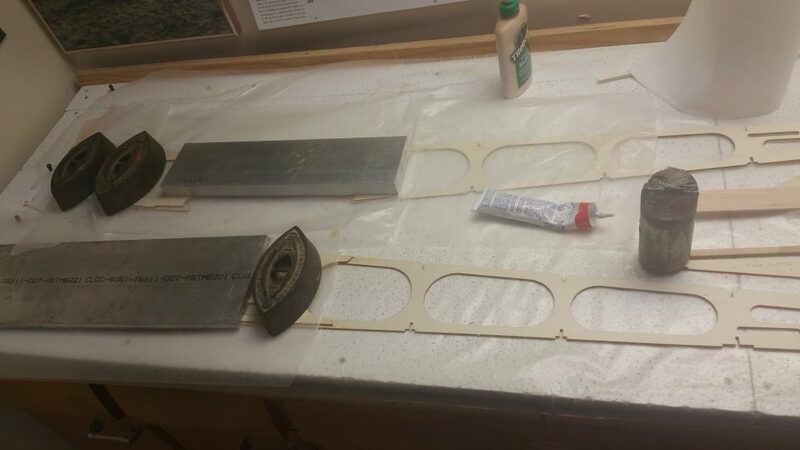 Peter kindly had the sheeting for the (tail) stabilizer of my plane glued together. We marked out one side of the sheeting tracing the framework with a pencil to know where the stabilizer framework had to go on the sheeting and then flipped over the framework. I placed glue along the entire surface that was coming in contact with the sheeting while Peter spread it. 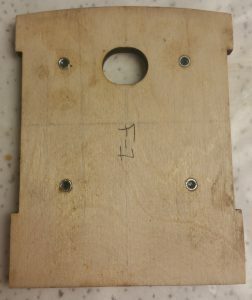 I then flipped over the framework, placed it on the sheeting, wiggled for good glue disbursement and then temporarily pinned in place while I glued the other side. I removed the pins and placed the other set of sheeting onto the tail. 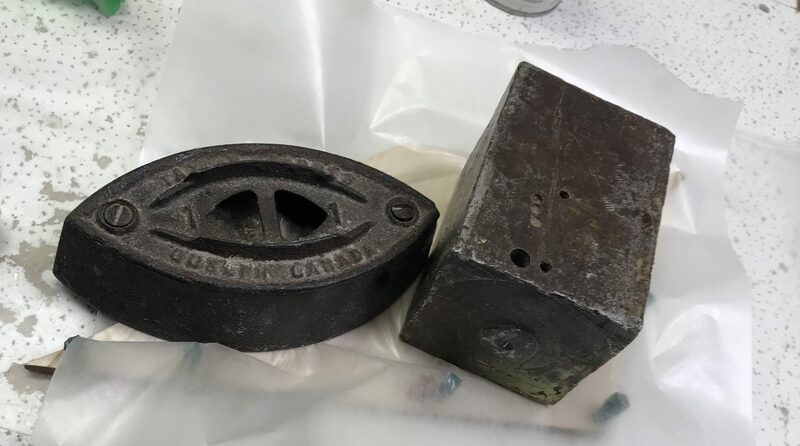 Peter then placed weights to hold everything snuggly together while it dries. Glued sheeting to both sides of the stabilizer I did on day 1. The next step was buidling the fin. Found it on the plans, pinned it in place followed by pinning wax paper over it. 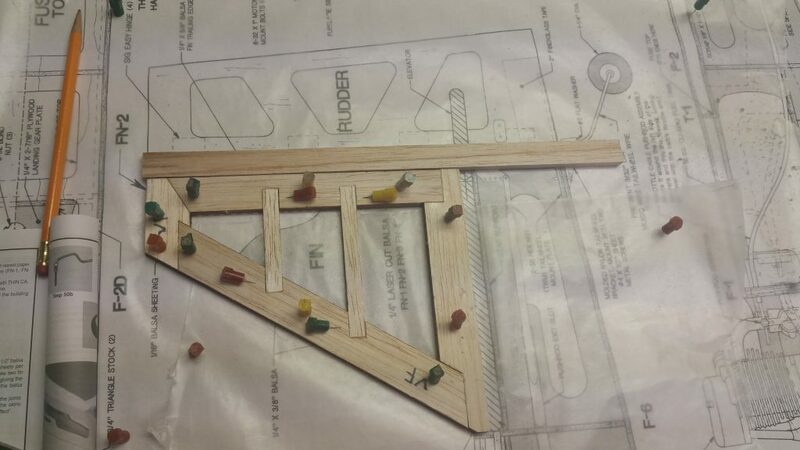 The next step was to find the pieces and line them up on the plans followed by gluing and pining. 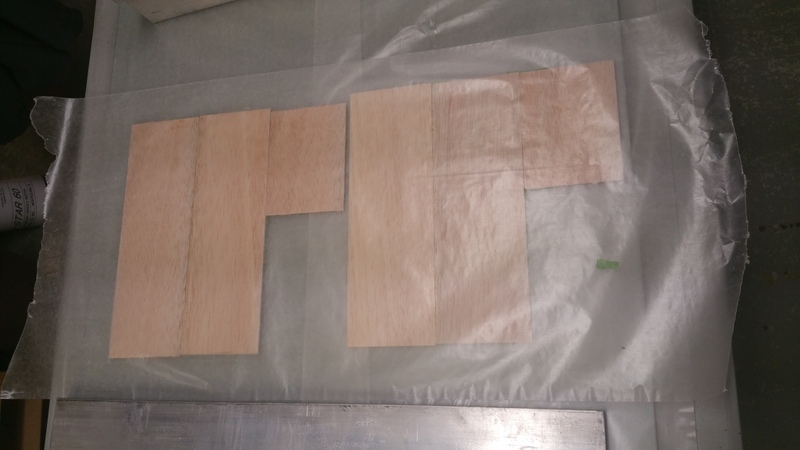 I then measured, cut, and sanded the rectangular ‘centre pieces’, need to remeber what their called and will update, until they fit snuggly but not to tight such that they are pushing out / warping the pieces already glued and pinned. After completing this phase I had what’s below. 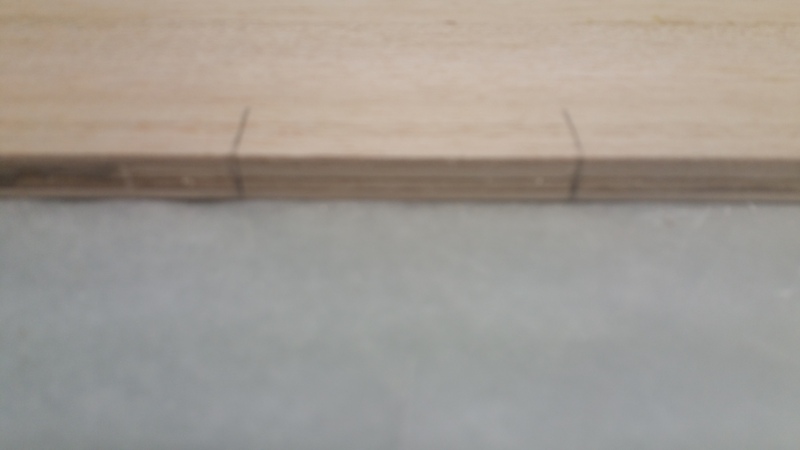 The long piece, trailing edge, is not attached yet however the bottom part has been sanded to give the desired angle and will be cut at the top when the time comes. 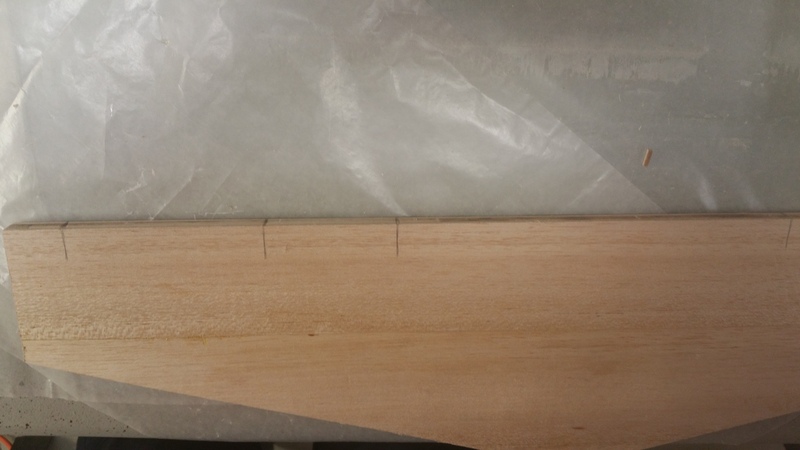 Tail fin framework glued and pinned. The last part for the day was to prep the sheeting for the fin. You always want to go oversized to ensure you cover everything and then can (what I imagine and will learn how) cut it down to size. This time Peter and I did it together. Peter tapped the back side using special tape (leaves no residue) and then folded the pieces back so I could run glue down between, top to bottom. Then we layed them down flat, on glass, and wrighted them down while the pieces dry together. That wrapped up another fun building session! I’m definitely learning little by little.